Posted on March 31, 2013 by Michele D.
Last year during Passover, I happend upon this Susie Fishbein recipe for a Meat and Potato Roll. I had all of the ingredients already so decided I’d give it a try. Since then, I’ve made this yummy dish many times. 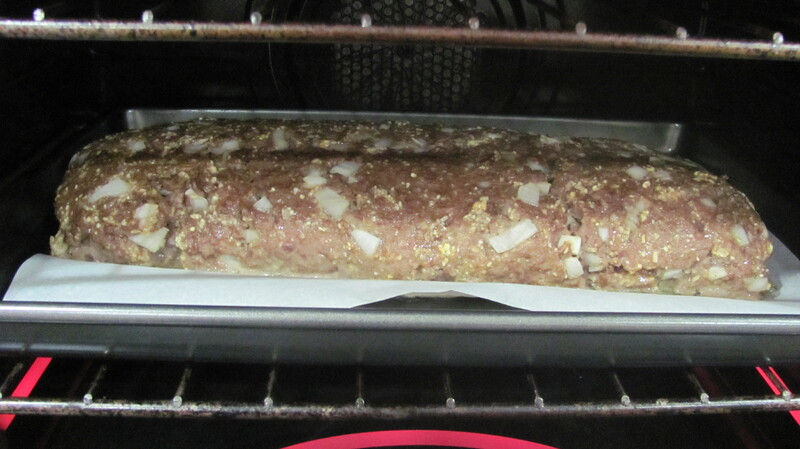 It’s now a staple in our home, similar to the meatloaf my Mother used to make every week when I was growing up. And it has affectionately been renamed to simply the “Meat Log” by my family. The recipe is on page 22 in the Passover by Design cookbook and it comes complete with a much more beautiful photo than the one you see here. If you don’t already have this cookbook, it’s worth the $20 you will pay on amazon.com because I use it not only during Passover but all year round. Cover a jelly-roll pan with parchment paper. Prepare a second sheet of parchment paper. Set aside. In a medium bowl, combine the beef, onion, matzo meal, onion powder, garlic powder, creamer, eggs, salt and pepper. Use your hands to really combine. Place your prepared jelly-roll pan lengthwise on your work surface. Place the meat mixture on the prepared pan. 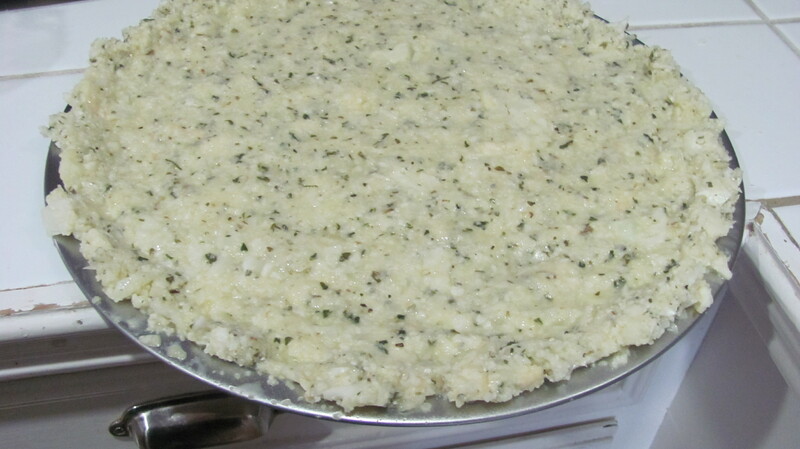 Pat to an even thickness, filling the pan widthwise and spread the mixture to an 11-inch length. Prepare the potatoes acording to package directions, adding more creamer, one tablespoon at a time, if they seem dry. Place the potatoes across a shorter edge toward the bottom of the meat, but not at the very edge. 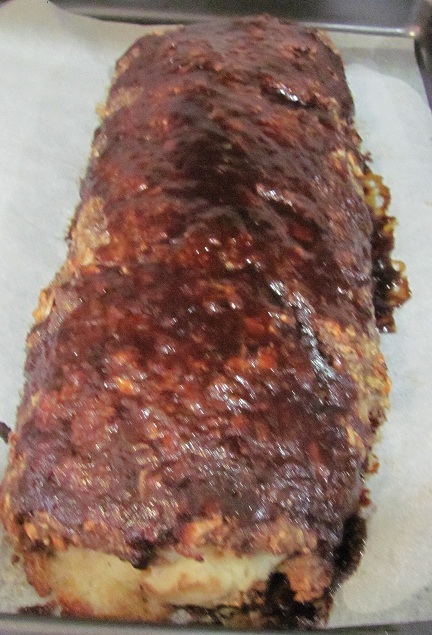 Use the parchment paper to help you roll the meat into a log. 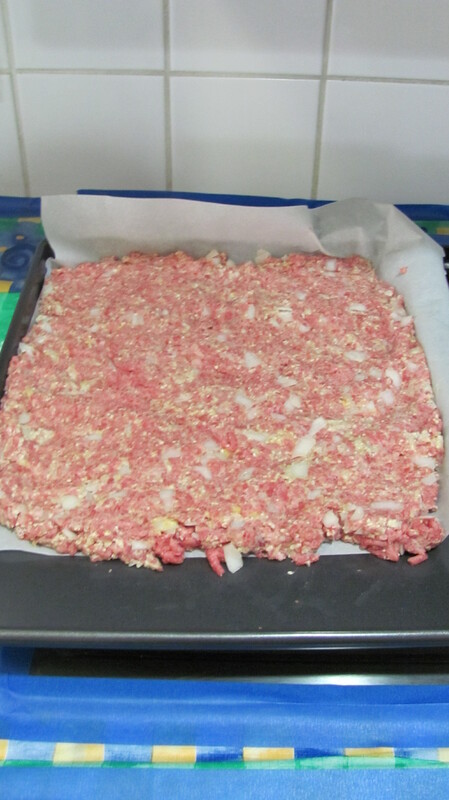 Place the fresh sheet of parchment paper on the pan and place the meat roll onto it. Discard the original piece of parchment. Bake 1 hour uncovered. In a small bowl, mix ketchup and brown sugar. Brush over the meat roll and bake an additional 15 minutes. Cut the meat log into 1 to 2 inch slices and serve on a pretty platter while it’s hot. For some reason this year, the meat around the mashed potatoes was still a little raw. We ate it anyway and no one got sick, but I probably should have flattened the meat out to be a bit thinner. Also, regarding the mashed potatoes, I usually have big plans to substitute the instant ones (which are very high in sodium) for the real thing instead but it never works out because I’m always short on time. I have an amazing recipe for sour cream garlic mashed potatoes that I think would make this “meat log” even more Treiffy delicious. I would just sub the pareve Tofutti Sour Cream for the dairy version. This Oprah recipe is similar to the one I use. If you have the time, give it a try and let us know how it turns out. Either way, this “meat log” is a crowd-pleaser. 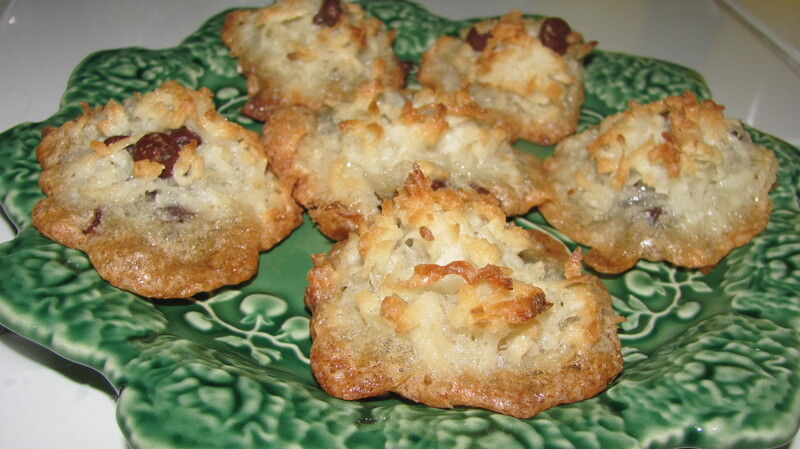 Posted on March 30, 2013 by Michele D.
A few weeks ago, I blogged about homemade Chocolate Chip Macaroons. I had never made macaroons before and they were so much better than the ones in a can that I swore I’d never go back to the “packaged” macaroons again. But … the day before Passover started, I was at my local Tom Thumb grocery store finishing up some last minute shopping when I discovered the yummy item pictured above – a Manischewitz Kosher for Passover frozen macaroon dough. The dough comes in Coconut and Chocolate flavors, althoug my store only had the coconut. The $6.49 price tag seemed way to high, but I was so tempted that I splurged and bought 1 package. Just before time for the holiday to start, my 6 year old daughter and I decided to make a batch of these macaroons. The process was very simple: scoop out a tablespoon of the dough, place on greased cookie sheet, flatten the top a bit with the back of your spoon and bake. 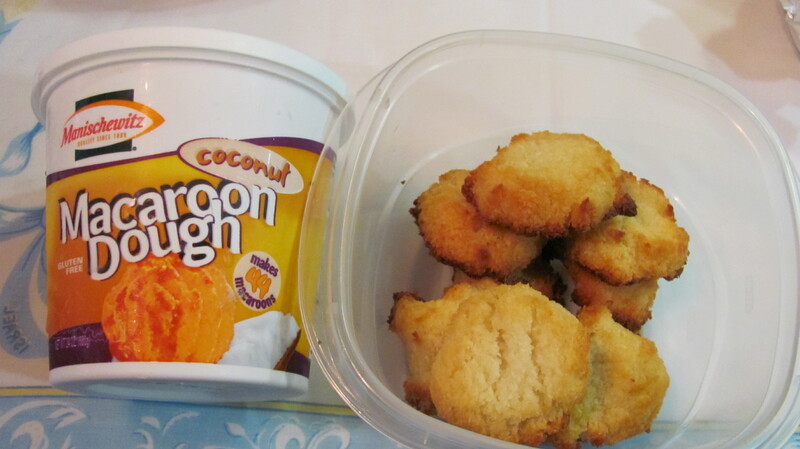 We were amazed by how easy the macaroons were to prepare and even more so by how delicious they tasted. Our Seder guests asked me to pull the package out of the freezer so they could see exactly where this yummy dessert came from. No one believed the macaroons were made from a frozen dough. I went back to Tom Thumb yesterday hoping the macaroons would be on sale so I could buy a few extras but no luck. Still $6.49 but also still a bunch left so I’ll be checking back next week as well. If you have time, check the frozen kosher for Passover section at your local grocery store to see if they have this easy dessert. It’s definitely worth having in your freezer for those times you need to whip up a quick dessert for guests or even an after-school snack. 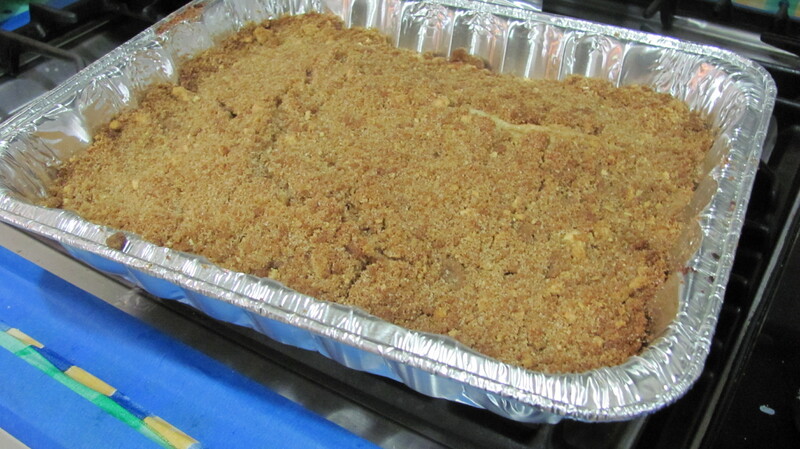 Posted on March 28, 2013 by Michele D.
You may recall as part of my Passover Cooking Frenzy, I made a Crumb Cake from the Passover by Design cookbook. I didn’t have high hopes for the cake because it looked like, well … sand. It appeared to be so dry that I called my MIL and asked if she could bring another dessert because I was afraid mine would end up in the trash. Let me tell you that we were all so pleasantly surprised by this cake. I think it’s the Passover diamond cake in the rough because the taste is completely amazing. It looks like sand but has a moist, fluffy, almost angel food cake like taste. And what’s even more odd is that there is a hint of apple flavor in the cake, even though there’s not an apple anywhere to be found. Even my hubbie, who is not a dessert person, loves this cake. 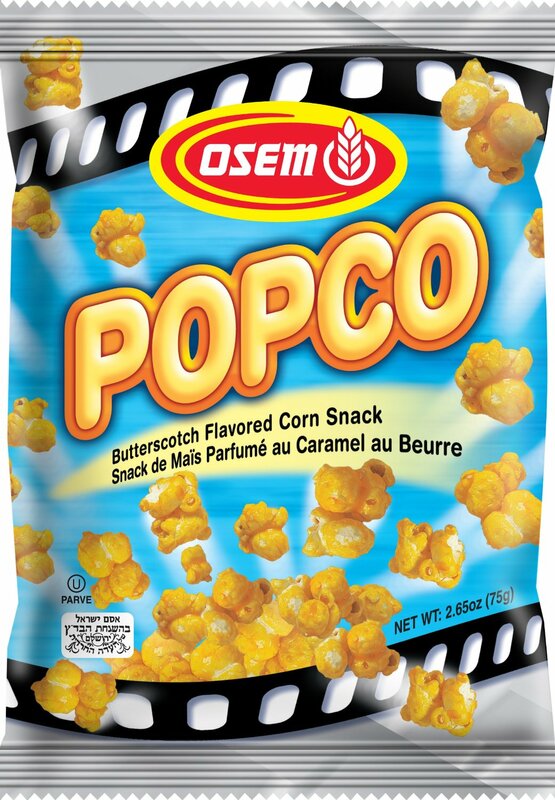 I tried to find an online version of this “beauty” but had no luck. So if you have the Passover by Design cookbook, it’s on page 248. If not, drop me a comment and I’ll hook you up. Enjoy the rest of your Passover and Happy Kosher Treif Cooking! Posted on March 24, 2013 by Michele D.
Today should officially be declared “Pesach Cooking Frenzy” cause I’m guessing I’m not alone when I say I have spent the entire day in the kitchen getting ready for Passover. Who’s with me? Can I get a Yes Ma’am! It has been a nutty day to say the least and while I’m not completely finished, I’m much further along than I expected to be and have by far beat my record from last year. Having a full free day to cook definitely helps. No time for recipes today but here’s what’s on our Seder menu so far. 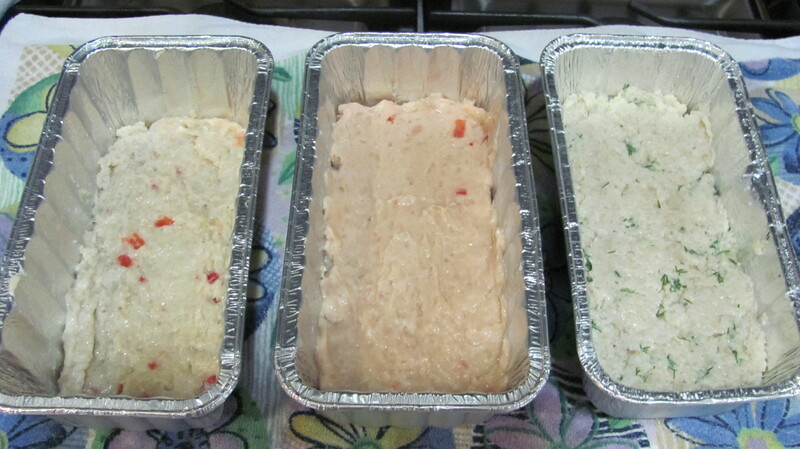 Pictured above, Tri-color Gefilte fish in progress. I make this dish for almost every holiday now and it has become a fav with everything except for my hubbie. He still can’t stand gefilte fish, but he’s OK with it because, as he says, it’s one less thing for him to fill-up on before the “real” food is served. Next up, what is affectionately called the “Meat log” in our house. I first made this delish dish last year for Pesach and now many of us our addicted. Pictured above is the meat portion of the dish before I roll it around mashed potatoes. To me, this one says “southern cooking” all over it. LOVE IT! One of my favorite foods is the Rotisserie Chicken that my hubbie makes on the grill. But when we looked into what it would take to Kasher our grill for Pesach, we decided it would be easier to just buy a new grill instead. 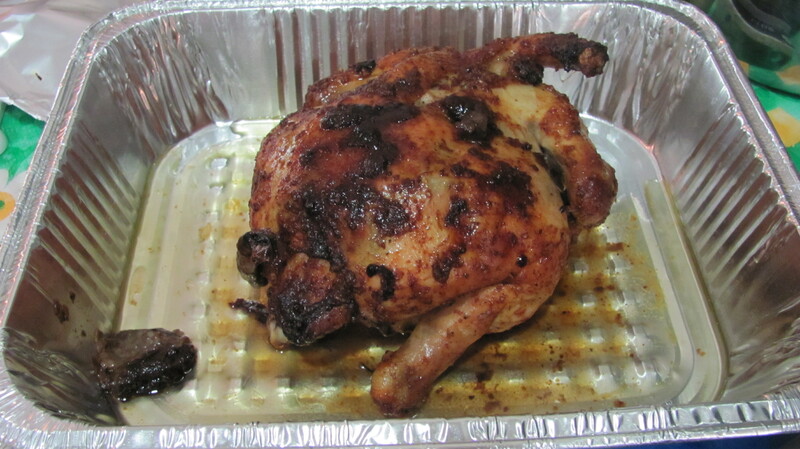 Fortunately, I found a great recipe for Slow Roasted Rotisserie Chicken in the Kosher by Design Passover cookbook. Look how beautiful this bird turned out. I wish we were having this for dinner tonight! As I mentioned in my Macaroon’s post, I’m not a big fan of Passover desserts simply because by the time I’ve cooked all day to prep for the Seder, I’m too tired to even think about dessert. But I decided to give this Crumb Cake a try and it was fairly easy, however it doesn’t look all that great. I’ll let you know how it turns out taste wise. 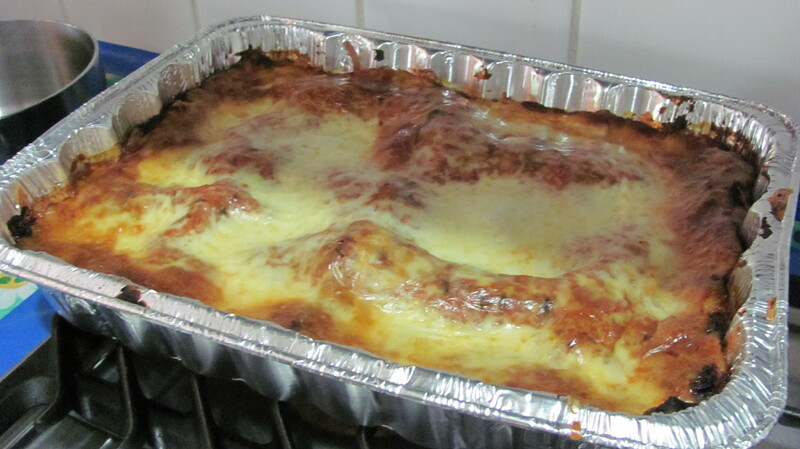 And finally, one of my favorite foods for Passover, Matzo Spinach Lasagna. I’m hoping to sneak in a dairy lunch for the 1st day so we can enjoy this Passover treat. How about you … have you been in the kitchen all day today? What yummy treats have you prepared for Passover? Happy Pesach and Happy Kosher Treif Cooking! Posted on March 18, 2013 by Michele D.
By the time I’ve finished cooking food for two Seders, the last thing I want to think about is Passover desserts. I’m exhausted, grumpy and quite frankly, know I’ll be annoyed when no one touches my desserts because it’s 1:00 am and everyone is too tired and too full to eat another bite. Case in point, last Passover I wanted to make the beautiful Chocolate Chip Cheesecake (page 260) in Susie Fishbein’s Passover by Design cookbook. I spent hours shopping for the ingredients (some of which seemed impossible to come by in Dallas) and then more hours making the cheesecake, which was barely touched during the holiday because everyone was way too full of Matzo! Nuff said. This year I decided to go easy on the desserts but still wanted to make something instead of buying the ready-made stuff, so I was thrilled to find this recipe for Almond-Coconut Macaroons from Martha Stewart. The ingredient list is short and the preparation is quick and easy. Perfect for the very tired Passover cook who HAS to make dessert but doesn’t really have much energy left. Plus, we love the store-bought macaroons that come in a can, but I’m guessing they are probably not the healthiest treat around so this recipe seemed like a great alternative. On baking day, I didn’t have any almonds on hand so I substituted pareve chocolate chips instead. I think you could play with this recipe and use all sorts of different ingredients like dried fruit such as cranberries or raisins. Preheat oven to 350 degrees. Line a baking sheet with a nonstick baking mat or parchment. Whisk together sugar and egg white in a large bowl. Stir in the remaining ingredients. Form dough into eight 2-tablespoon mounds, and drop each onto sheet, 2 inches apart. Bake macaroons until golden-brown on bottoms and edges, about 15 minutes. Let cool on sheets for 5 minutes. Transfer to wire racks, and let cool. Macaroons will keep, covered, for up to 1 week. 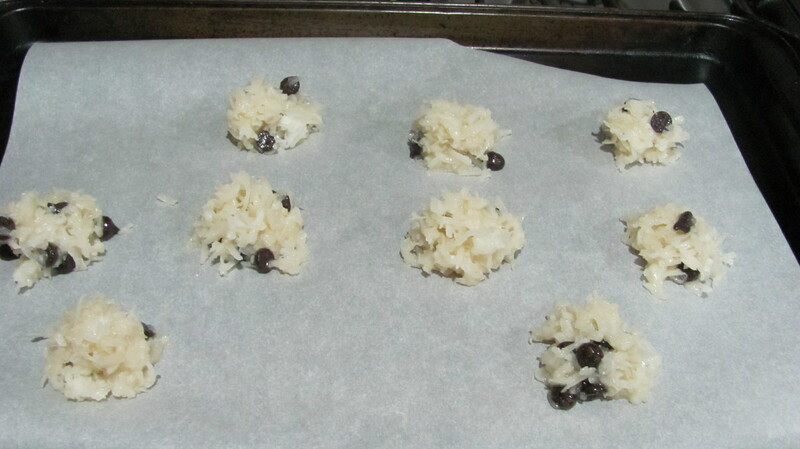 The above recipe only makes 8 or 9 macaroons so if you’re feeding a large group, you might want to double or triple the recipe … or you could even make multiple batches with various substitutions for the almonds such as chocolate chips or raisins, etc. Let everyone choose which one they like best. 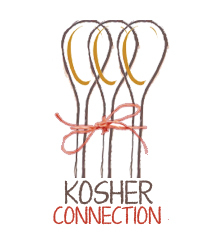 Happy – try to keep your sanity – Passover and Happy Kosher Treif Cooking! This month is Passover Desserts! Follow our recipes on Twitter with #KosherRecipes. Check out all the great recipes! Posted on March 17, 2013 by Michele D.
Last year during Passover, we were invited to eat at our Cousin’s house. 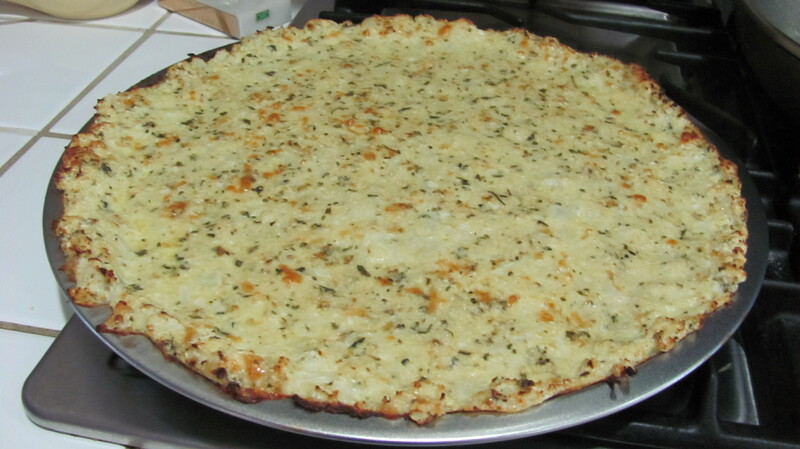 Dorit, who I consider to be one of the most creative cooks I know, had prepared a variety of unique dishes for Pesach, but the one that intrigued me most was a pizza made with a potato crust. It was delicious and seemed like a healthier option than the usual matzo pizza. So I decided to give it a whirl this year. 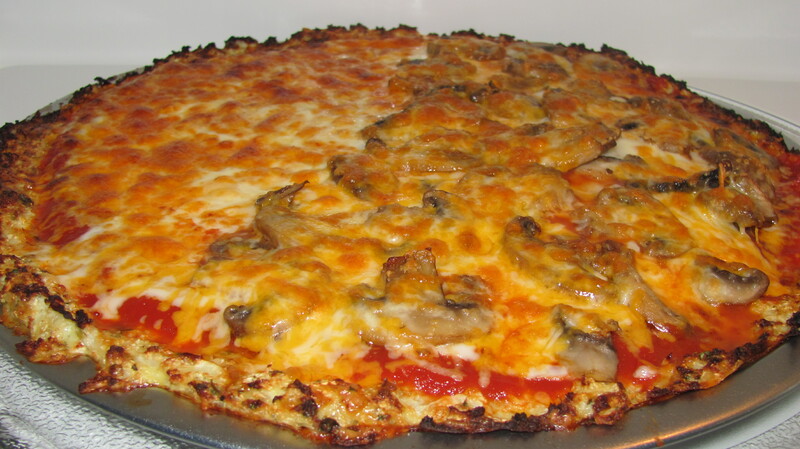 I started researching potato crust pizza recipes and before I knew it, I’d come upon something even more intriguing – lots of different recipes for pizza crust made with something called cauliflower rice like this one: Cauliflower Pizza Crust from SparkRecipes. It seemed like an even healthier option than potatoes so I bought the ingredients and got started. 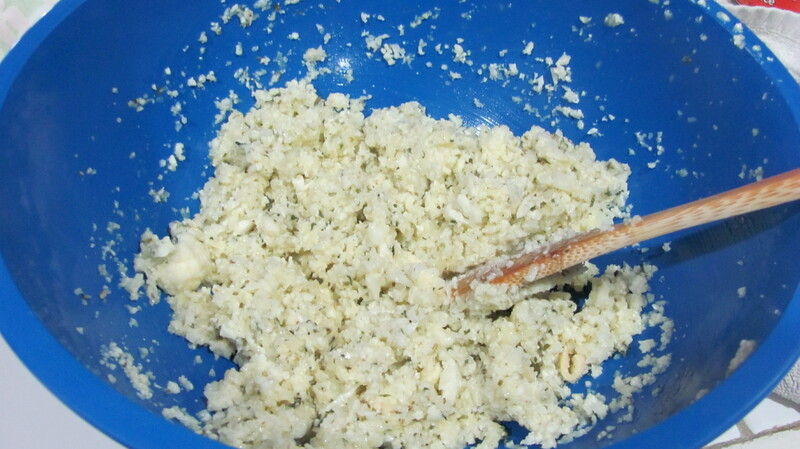 Beat egg, add the cauliflower, shredded cheese, fennel, oregano and parsley. Mix, then press into a greased pizza pan. Bake at 450 for 12 to 15 minutes. If you double the recipe cook 15 to 20 minutes. Add sauce, desired pizza toppings and cheese. Bake until brown and cheese is bubbly. Broiling for a few minutes works well. I found lots of recipes for Cauliflower Rice and am so sorry but can’t find a link to the actual one I used but do a Google Search and go with the one that seems easiest to you. Some call for using the microwave or a pan of water on the stove. The Saute method seemed like the quickest route to me. Remove core, leaves and wash cauliflower. Dry all pieces thoroughly before processing. 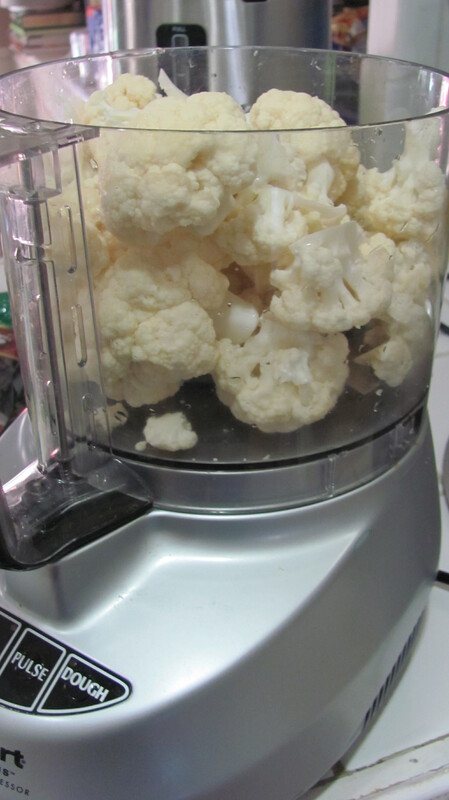 Place cauliflower pieces into your food processor. 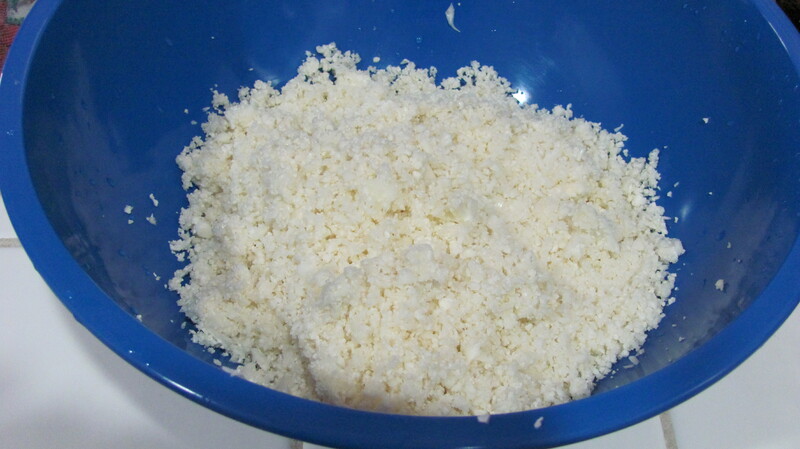 Pulse until cauliflower pieces are small and have the texture of rice BUT stop before the cauliflower gets mushy. In large skillet, heat olive oil over medium head. Add cauliflower to pan. Add salt and pepper. Cover and cook 5-7 minutes (or until outside of cauliflower is slightly crispy and inside is still soft). This pizza smelled amazing when it was cooking and tasted even better when it was hot and fresh out of the oven. The crust is not thick enough that you can actually pick it up like a regular pizza so have a fork handy. It’s also best eaten right away although I did reheat it the 2nd day. While it tasted great, the crust was very mushy. What creative cooking ideas do you have for Passover?